Republic of Moldova ranks no. 22 in the Global Open Data Index 2015. 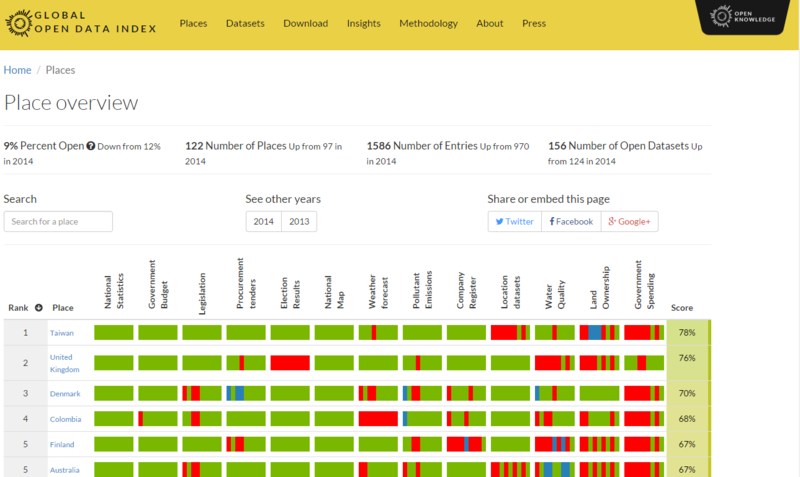 Thus, compared to 2014, Moldova has climbed 21 positions in the world ranking of open data. The ranking is a methodology that evaluates open data sets available in 122 countries worldwide. Moldova is followed in the ranking by advanced in eTransformation countries, such as Republic of Korea - ranked no. 23, Austria and Singapore - ranked no. 24 and 25. Taiwan is ranked no. 1 in the Global Open Data Index 2015, followed by the UK and Denmark. Global Open Data Index assesses the state of openness of specific government data sets pursuant to Open Definition. The ranking aims to create a better dialogue between the government and the civil society on open data. The state of openness of data is assessed under the following criteria: impact on citizens, use of data by citizens and institutions/government organizations, etc. The Republic of Moldova participated for the first time in the Global Open Data Index ranking in 2013. Then our country ranked no. 19, being surpassed by countries as Romania, Portugal and France. The open government data portal date.gov.md, launched on 15 April 2011, is a key pillar for the eTransformation agenda of the Government of Moldova and aims to facilitate citizens' access to the data of ministries and central public administration. Currently www.date.gov.md has 879 data sets provided by 48 central public authorities. Recently, www.date.gov.md reached a record of over 1 million downloads.